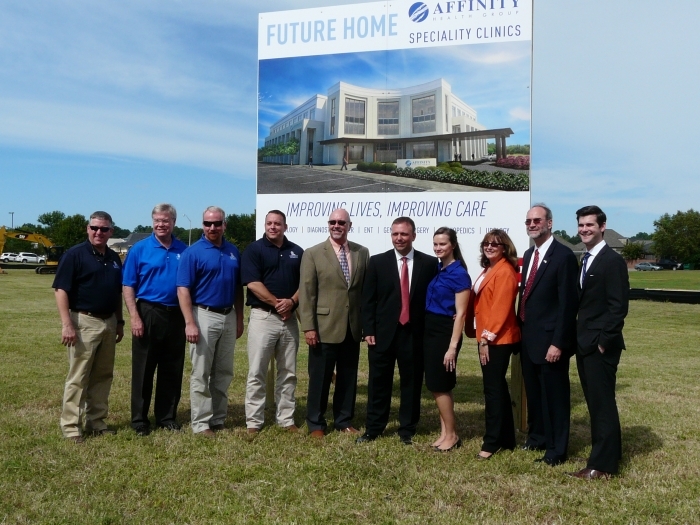 Ground was officially broken recently for the new Affinity Specialty Clinics building adjacent to Monroe Surgical Hospital on Broadmoor Blvd. in Monroe, Louisiana. This 93,233 SF campus addition is a three-story facility divided into 15 separate clinics, each with one or two physicians as well as administrative and conference room spaces. Approximately 100 medical professionals will work in the new addition. Lincoln Builders is honored to be team members with the Affinity Health Group, Christie Echols, consulting architect, and Cooke, Douglass, Farr, Lemons Architects+Engineers. 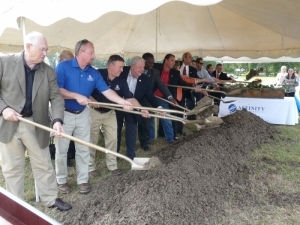 Pictured in front of the project sign are (left to right): Clint Graham, Ayres Bradford, Jerry Brasher and Rich Nadler of Lincoln Builders; Mike Reese of CDFL; Mike Echols of Vantage Health Plan; Christie Echols, consulting architect; Mrs. Sissie and Dr. Gary Jones of Vantage Health Plan; Colby Dearman of CDFL. Pictured behind shovels are (left to right): Monroe City Councilman Dr. Ray Armstrong, Lincoln Project Manager Jerry Brasher, Lincoln President Clint Graham, Louisiana Rep. Bubba Chaney, Monroe Mayor Jamie Mayo, 5th District Rep. Vance McAllister, and from Affinity Health Group Mrs. Sissie and Dr. Gary Jones, Dr. Joel Norris, Christie and Mike Echols.